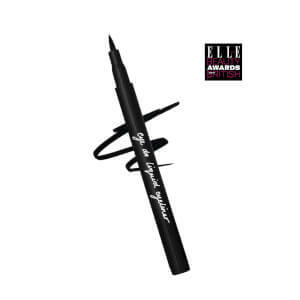 Expertly define your eyes with the INKcredible Waterproof Gel Eyeliner Pencil from Laura Geller. Its silky smooth formula glides on effortlessly to deliver intense, highly pigmented color with a long-wearing, professional finish that won't smudge or run. Features a built-in sharpener for precision application every time. Safe for contact lens wearers and sensitive skin. Gently pull eyelid taut and line top and/or bottom lashlines. I do like the softness of this pencil but I don't like the sparkles. They are chunky and look too glittery. I wasn't expecting that at all. It also can feel a little greasy. It's easy to remove with eye make up remover though. I purchased this gel liner in two colors. The staying power of the liner is excellent; but one of the liner's tips snapped off on first use. You just twist up more liner to make some more available, but I've come to expect better quality from Laura Geller. This snapping off of the tip that has been exposed has only happened to me before with less expensive liners. It's usually an indication that the texture of the liner is too hard, and thus application needs to be forced. Colors are true, but beware on application. Gel eyeliner is a beautiful class of eyeliners. It feels somewhere between liquid and a pencil. Glides on super smooth and easy like the best pencil you've ever had. Stays forever but stray marks easily wipe off. Would smudge well too.